Guess what’s in for a cost effective and scalable technology for disease detection in plants! It’s artificial intelligence in the news again. It wasn’t long back when a team of researchers taught an AI to recognize crop diseases and pest damages. In a submission by Amanda Ramcharan and her team, they used transfer learning for image-based cassava disease detection. The new transfer learning method that used dataset of cassava disease images taken in the field in Tanzania, can be easily deployed on mobile devices without accessing the cloud. Transfer learning was applied to train a deep convolutional neural network to identify three diseases and two types of pest damage. The best trained model delivered an overall accuracy of 93%. Amidst its soaring popularity, artificial intelligence is gaining rapid momentum in the area of farming. As it is growing popular with farmers, AI as a tool an be seen easily being implemented for killing weeds, harvesting better crops and producing a better yield. There have been many developments in India and abroad that speak of growing relevance of AI in farming. With technologies like drones, intelligent monitoring systems and robots making into field trials, there is no denying that artificial intelligence is set to bring the next phase of ultra precision agriculture. Let’s glance into few of these technologies that are making headways into agriculture. Image/ Facial recognition- This largely adopted technology has been popular with a lot of smartphones and has climbed onto the area of agriculture. These devices can eliminate the need of fitting devices and allowing easy monitoring of plants with minimal interaction. 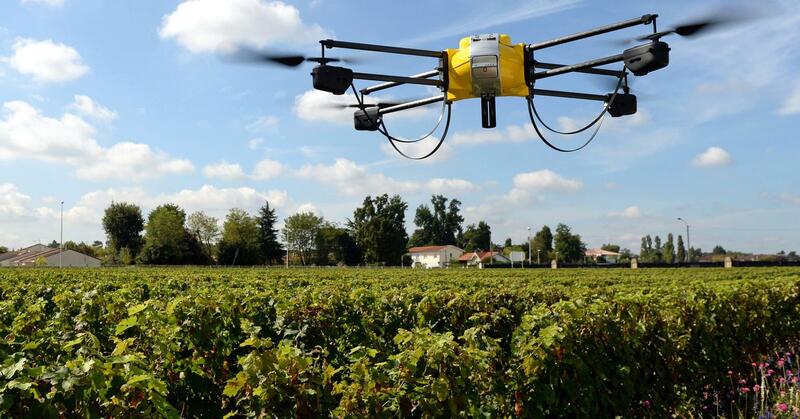 Drones- This is the next wave of revolution hitting a farmer’s field. It can facilitate in-depth field analysis, easy and efficient crop spraying and crop monitoring. Automated irrigation system- As the name suggests, these are designed to utilise real-time machine learning to constantly maintain desired soil conditions to increase average yields. It may result into lesser costs and labour involved. Crop health monitoring- Companies are developing automated detection and analysis technologies such as hyperspectral imaging and 3D laser scanning that will increase the precision and volume of data collected, hence a better analysis and better results. Others that can be soon introduced into farming are driverless tractors and chatbots, where conversational virtual assistants powered by AI can interact with farmer in a personalized way. As we know chatbots have already made its presence felt in areas like retail, travel, media, insurance etc. The popularity for these technologies go well into all sorts of application in the farming sector. Abundant Robotics, a US based startup has developed an apple-picking robot. According to the company it can identify, pluck, and place apples into a crate with roughly the same accuracy and care as a human. There also has been instances of AI and machine learning being used to eliminate weeds and hence taking care of plants with utmost precision. Deere & Company acquired Blue River Technology, a pioneer in applying machine learning to agriculture. The latter had earlier applied machine learning to agricultural spraying equipment and intends to extend machine learning usage to enable every farmer in the field to optimize every plants. NatureSweet, a texas based company is using AI to monitor tomatoes in their growing season. With cameras installed and algorithms set in place, the company tracks all sorts of emerging problems in plants. The company claims that the AI system has helped increasing the harvest between two and four percent, and the founders hope that number will eventually climb to 20 percent. There were also reports of Harper Adams University and Precision Decisions recently testing autonomous drones and vehicle to plant, maintain and harvest a crop, and taking away the credit of being the first in the world to do so. A Georgia based startup called AgVoice is developing natural language processing toolkit for farmers. The system interprets sudden death syndrome for the soy fungal disease and prompts for the location and severity of the observation. Back in India, the efforts in the direction of artificial intelligence and advanced analytics have been slowly pacing up. While it has marked a spectacular development in other domains such as healthcare, retail, e commerce etc., in terms of introducing AI, farming is yet to take a centre stage. In a very recent development, Karnataka government signed a Memorandum of Understanding with Microsoft India to develop a multi-variant agricultural commodity price forecasting model. Taking into consideration Tur crop to understand the working of prediction model, this model is set to take into consideration historical sowing area, production, yield, weather datasets and other related datasets as relevant, to produce desired result. Believing that intelligent technologies can deliver solutions in the agriculture sector, the move is aimed at using digital tools powered by AI to help farmers get higher crop yield. It had been reported that Microsoft in collaboration with ICRISAT has deployed a Sowing Advisory Service in the kharif season on a limited pilot, under the “Bhoochetana” project. These have been built on the Microsoft Cortana Intelligence Suite. While Microsoft is stepping ahead with Karnataka to develop price-forecasting model, IBM Research Labs is making its tools available to entrepreneurs/startups to develop solutions. The AI, cognitive computing, image processing and other advanced technologies by IBM would be made available to bring innovation solutions in the Indian agriculture space. Another effort in the Indian agrarian space involves New Delhi and Lucknow based Agritech startup Gobasco provides AI-powered data-driven supply chain optimisation platform. It carries out real-time data analytics on data-streams. It is one of first investments of Matrix Partners India in Agritech sector. Apart from being highly accurate and fast, these AI technologies are quite affordable. Experts claim that it may not be the most exciting technological venture, but can be quite beneficial. Leading a way into bringing high quality food, it is also speculated to be fighting against world hunger. Though there are opinions about AI being too rigid for agricultural environments, the advancing of AI in farming is reaching newer heights, and is expected to grow more!